With the current , CEO Adrian Hallmark has said that the next version will be positioned a level higher to fend off strong competition from the AMG and Maybach versions of the Mercedes-Benz S Class. Speaking to , Hallmark indicated that the current pricing of the base Flying Spur actually undercuts top-spec S Class variants and he wants to move the new model more upmarket to around the $260,000 mark in Europe. The current Flying Spur offerings in the US range between $190,000 and $244,600 before options, whereas an AMG S 65 starts at $232,550, so a similar overlap exists here too. 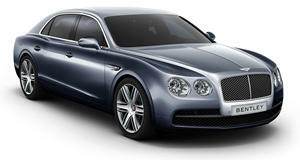 Increasing the pricing for the new Flying Spur would put some clear air between it and the top Mercedes variants. However, it would need to come with a lot more tech and luxury to justify those numbers and Hallmark promises that that will indeed be the case. First off, already used on the Continental GT, it will also get Porsche’s sporty gearbox although profiled to shift the way Bentley customers expect. Perhaps unsurprisingly there will also be a plug-in hybrid option possibly sharing some of its running gear with the recently introduced 443-horsepower Bentayga Hybrid. Hallmark said that the biggest market for the Flying Spur is right here in the US, where it is used more as a daily driver rather than to be chauffeured around in. The Porsche underpinnings should give the new luxury GT a sharper handling feel on the road. Let’s hope it doesn’t lose some of its imperious Bentley waftiness in the process.